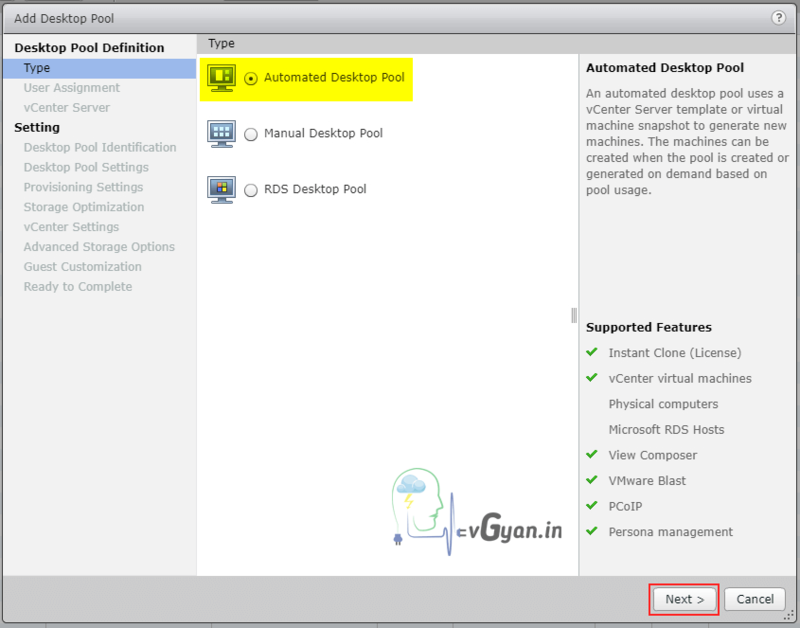 Today we will discuss about How to create Dedicated Desktop pool with Linked-Clone Technology. 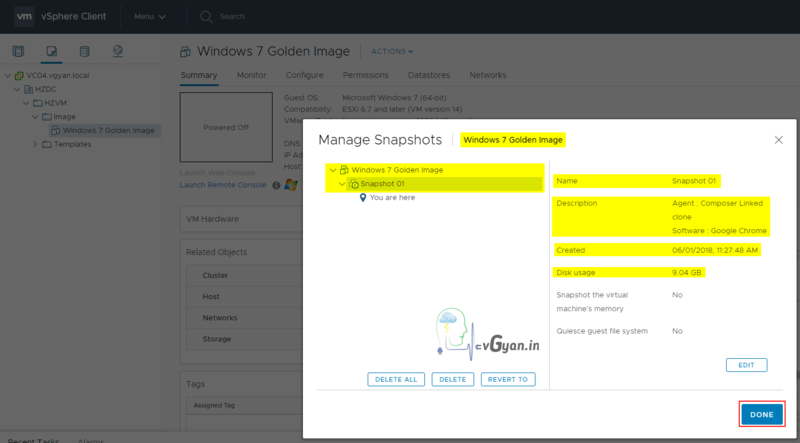 In my previous blog post we discussed about how to create Windows 7 Golden Image and we have already taken Snapshot 01 on golden image. 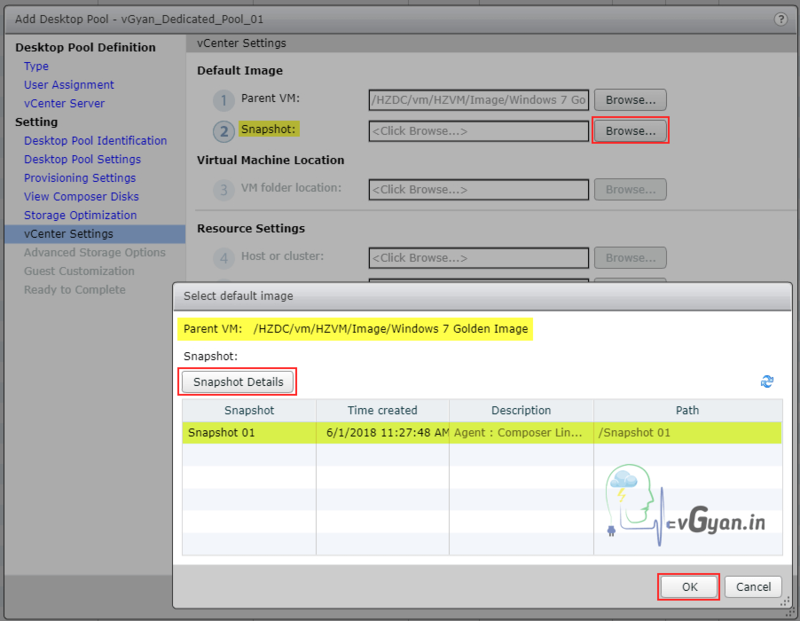 Verify Golden Image snapshot availability from vsphere client. There are multiple steps are involved on Desktop Pool Creation, I tried include all the screenshots which I taken from my lab environment. 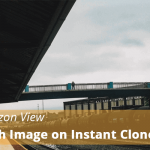 Today we going to discuss about Automated Desktop Pool with Linked Clone technology. 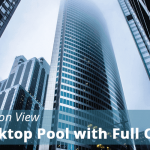 As I mentioned earlier, we are going to deploy dedicated desktop pool. 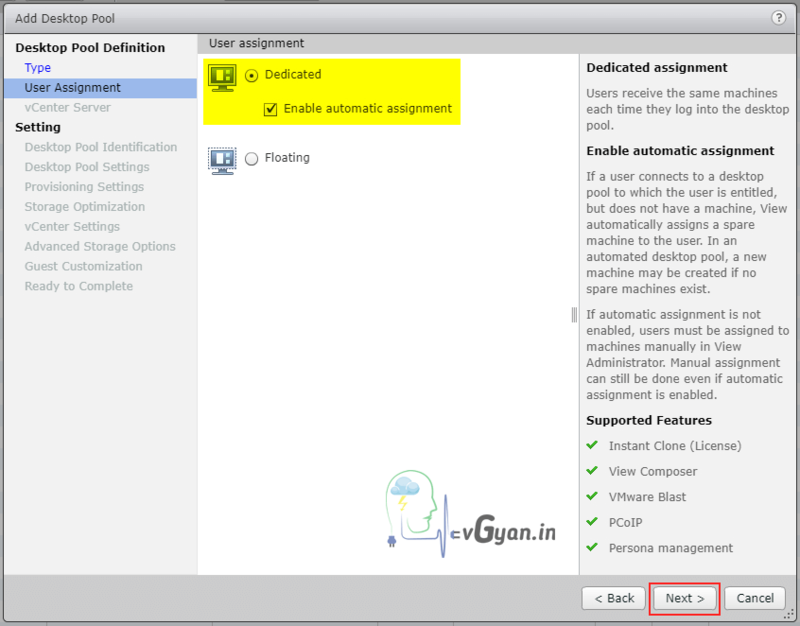 So select Dedicated and Enable automatic assignment option. 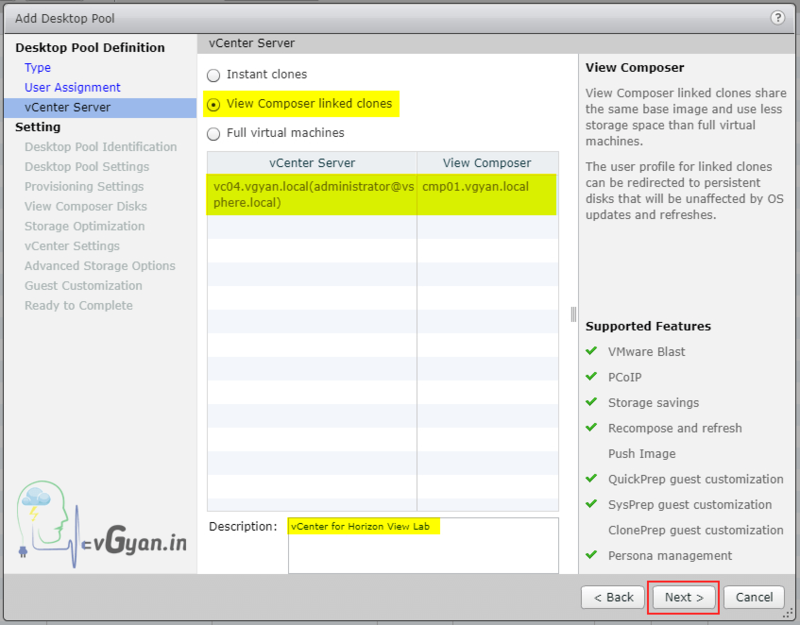 Select View Composer linked clones option and select targeted vCenter server and view composer which we already added to view environment. Under General, we have three options. Connection Server Restrictions: you can restrict connection servers according to your design requirements. Category Folder: You can select specified category folder from here. 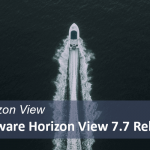 Under Remote Display Protocol, we have seven options. 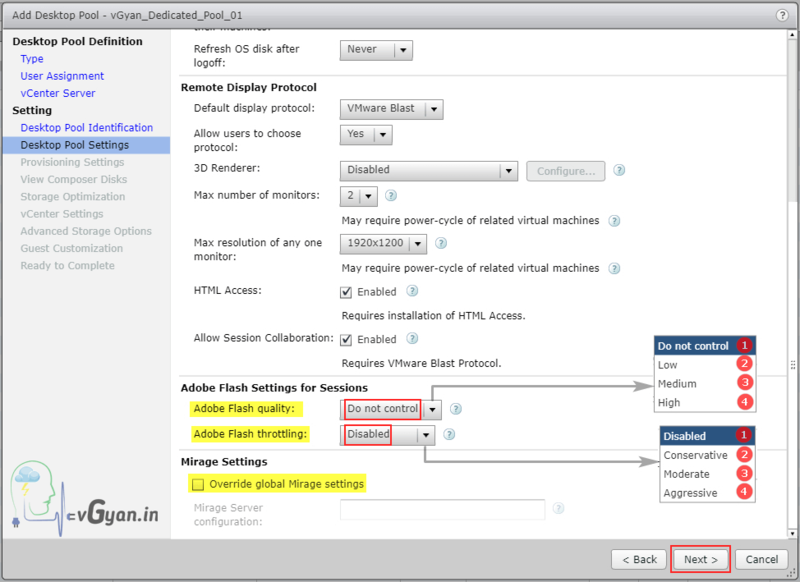 Under Adobe Flash settings for sessions, we have two options. I am not using Mirage at this point of time. 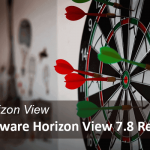 Under View Composer Disk, specify Persistent Disk and Disposable File Redirection. 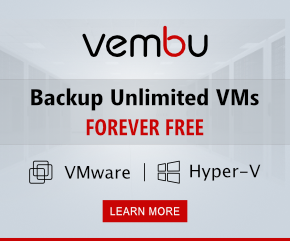 We can configure advanced options with regard to storage management and the placement of OS persistent and replica disk. 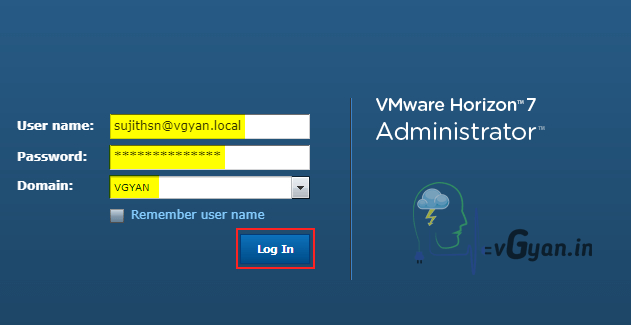 First option available for vSAN configuration, in my environment I don’t have vSAN. 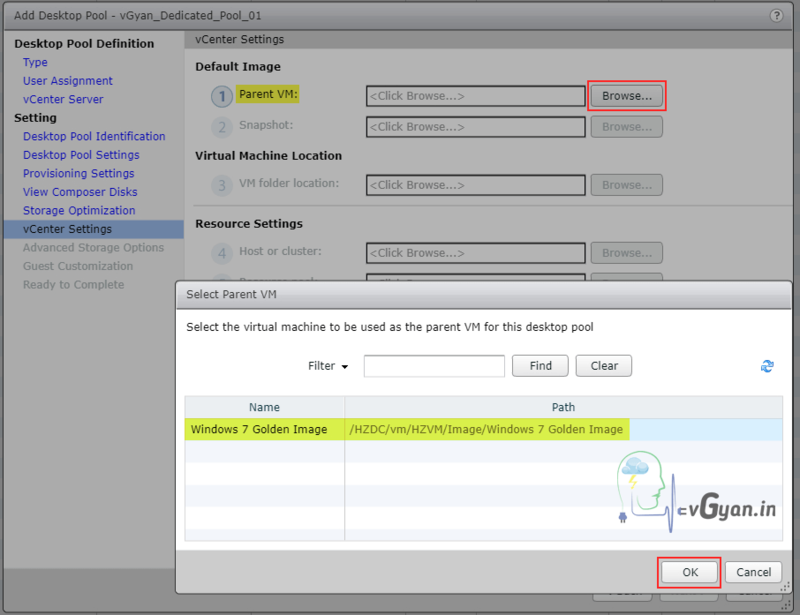 Select Parent VM from browse option, Select windows 7 Golden Image and click OK. Select Snapshot from browse option, Select snapshot 01 and click OK. 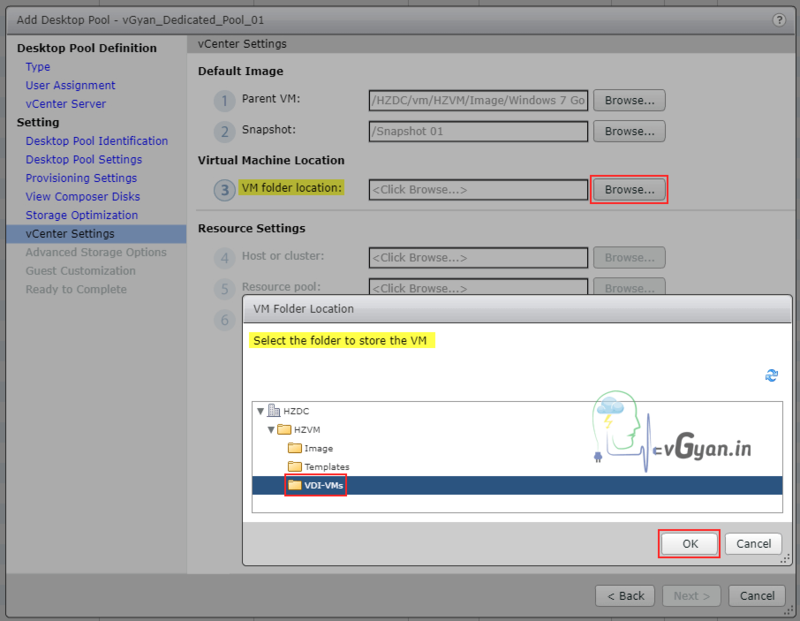 Select VM folder location from browse option, Select VDI-VMs folder and click OK. 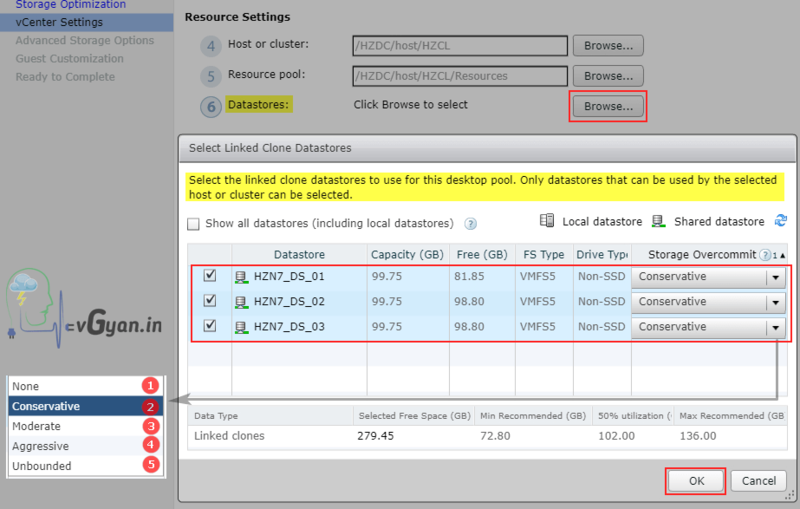 Select Host and cluster from browse option, Select HZCL cluster and click OK. 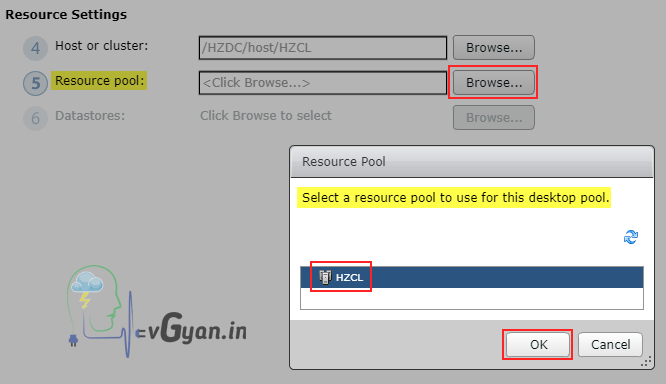 Select Resource Pool from browse option, Select HZCL cluster as resource pool and click OK. Select Datastore from browse option, Select available Datasores. 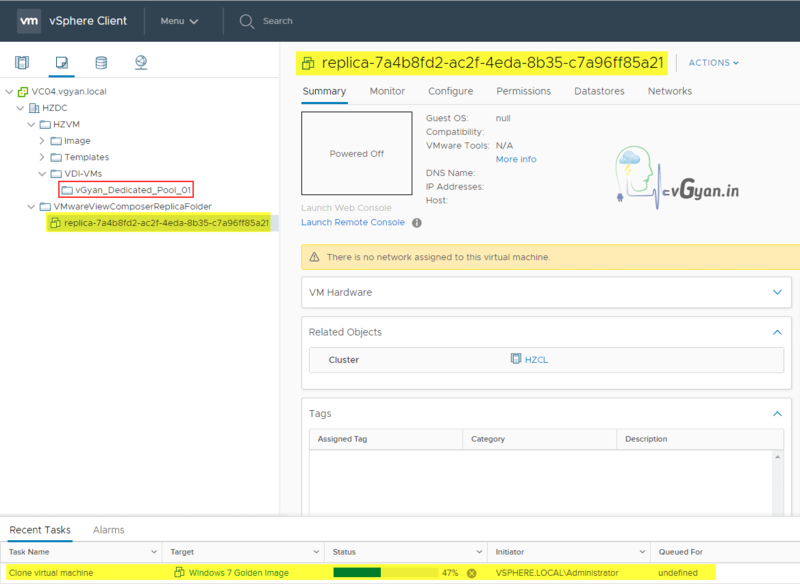 Storage Overcommit, we have five options available to choose (“None, Conservative, Moderate, Aggressive, Unbounded) Select storage overcommit according to your requirement and click OK.
Verify vCenter Settings and click Next. 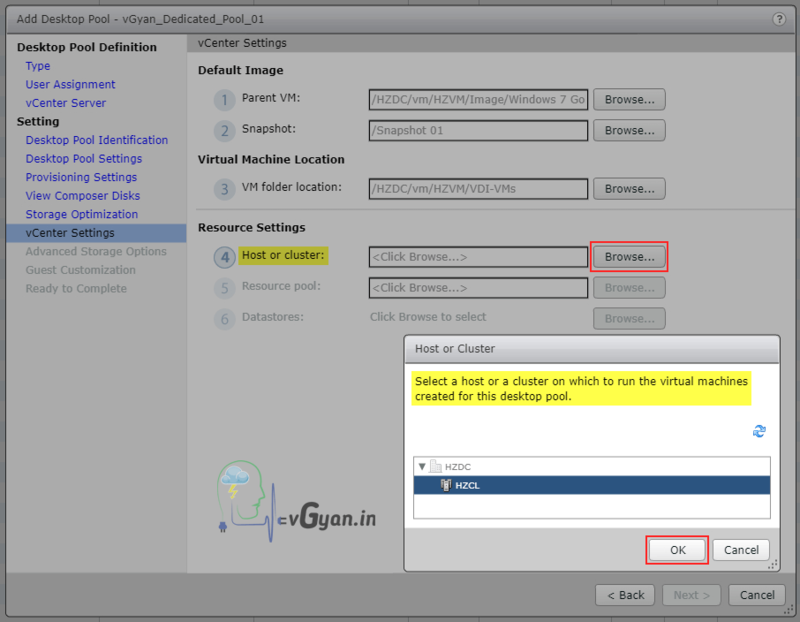 First option for View Storage Accelerator, which enhance the performance by caching desktop pool data. 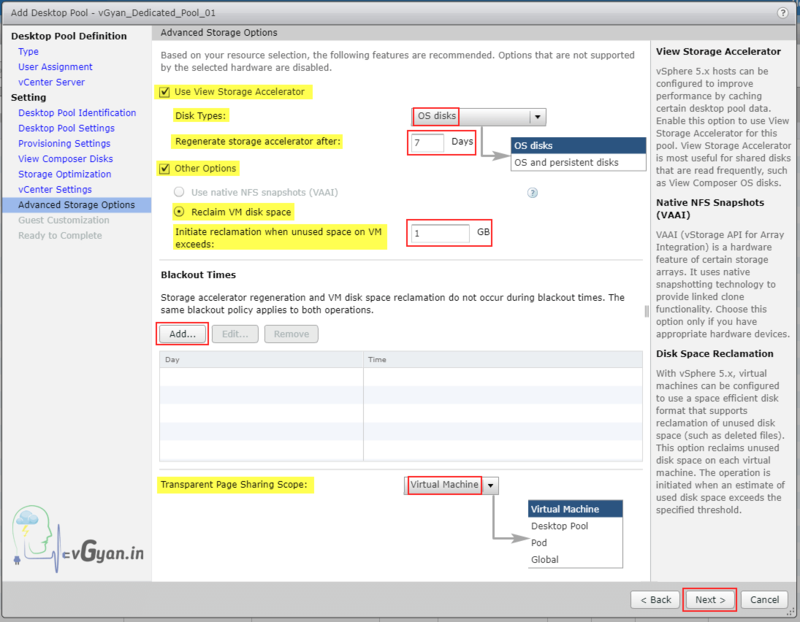 Tick the Use View Storage Accelerator box to enable it. 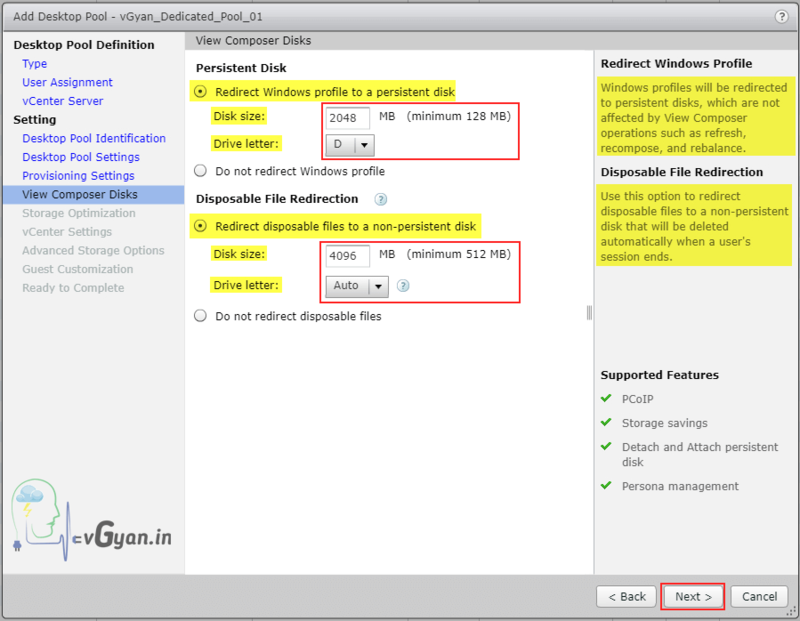 We can select OS disks or OS and Persistent disks option from drop down menu. 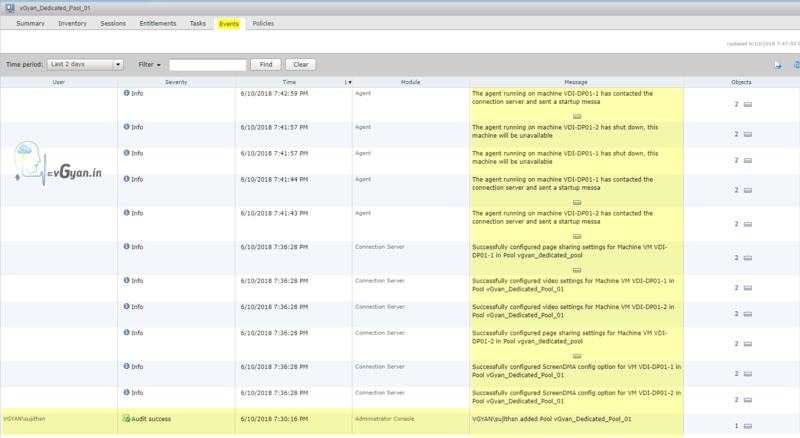 Last option on this configuration screen is to configure blackout times for cache regeneration and space reclamation. You can add blackout timings from here..
Transparent page sharing scope we have four options Virtual Machine, Desktop Pool, Pod and Global. 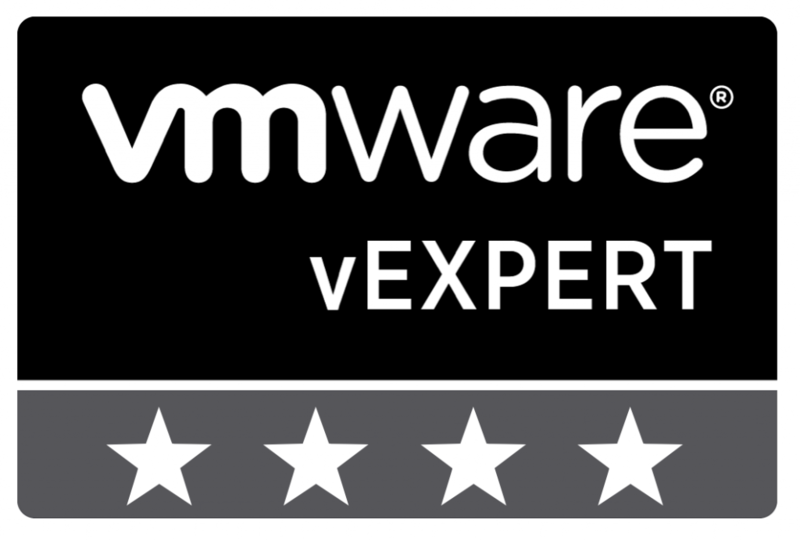 the newly created virtual desktop machines will reside. desktop accounts should be created. Note:- We can use “Entitle users after this wizard finishes” for entitling users to this desktop pool, but I will show you this later. 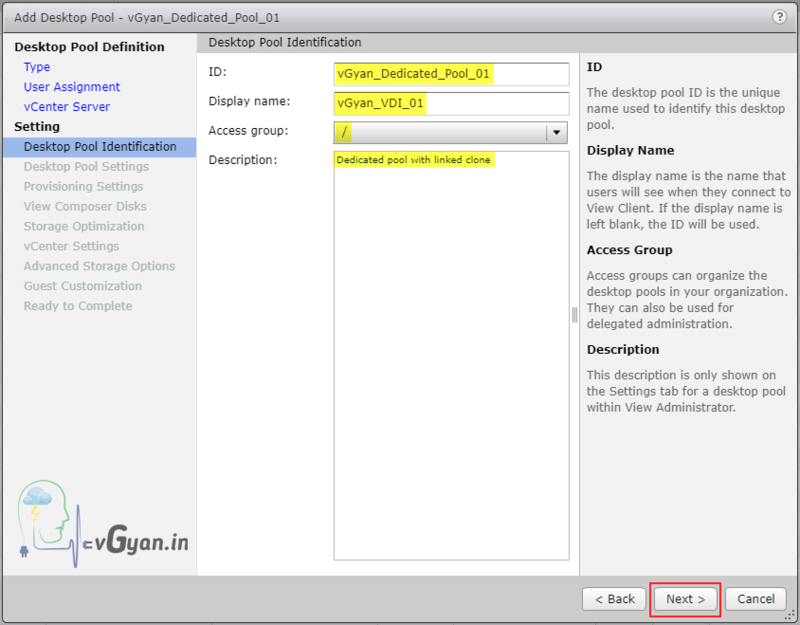 Under Desktop Pools tab, we can find newly created “vGyan_Dedicated_Pool_01” desktop pool. 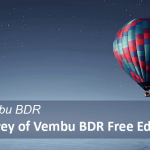 Double click on Desktop Pool, verify desktop pool property from summary tab. 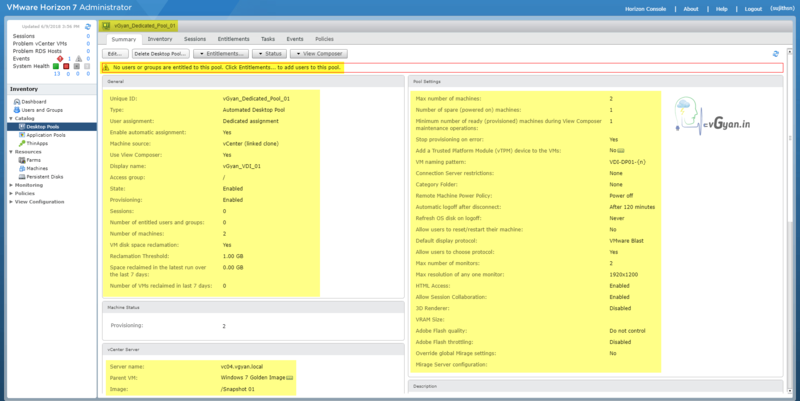 In targeted vCenter, first replica VM created from golden image. As we configured, there are two windows 7 desktops are created in vCenter, One VM is powered on and another one is powered off. 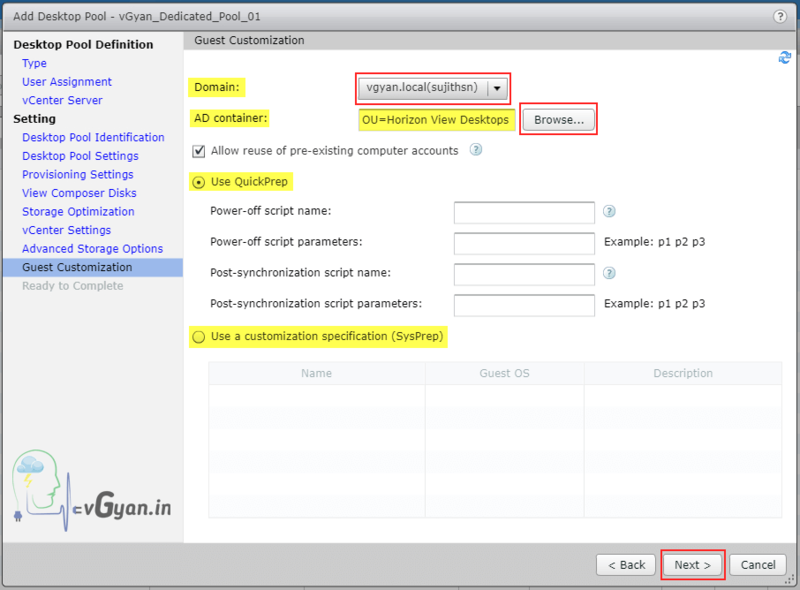 Once first VM connected to a user, second VM will be automatically power on and become available. 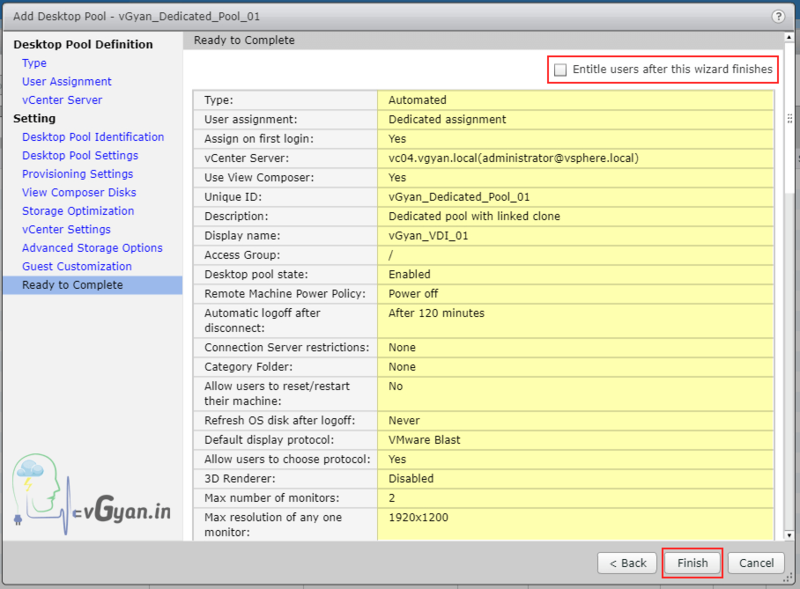 Switch to View Administrator, and verify both VMs are available in Inventory tab under newly created desktop pool. 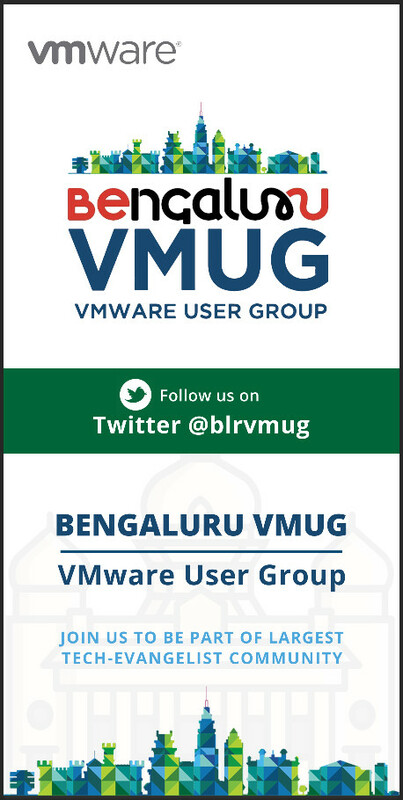 As you can see one VM in Available state another one in Provisioned state. 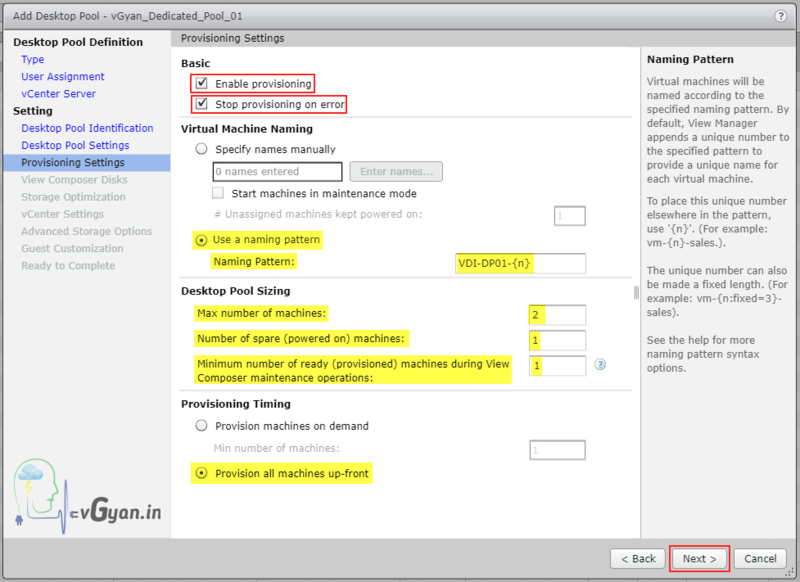 Under Inventory, Select “Machines (View Composer Details)” option to view Image details. 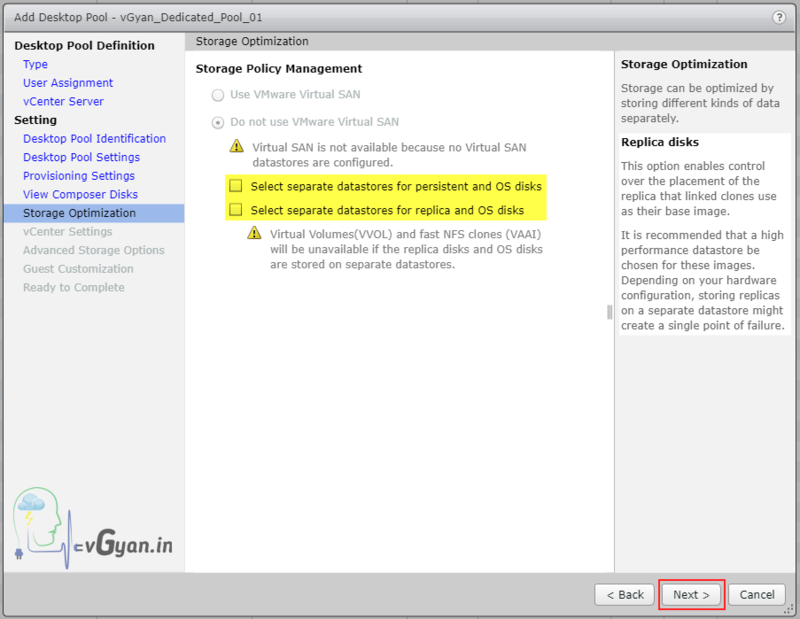 Under Inventory, Select “Persistent Disk” option to view Persistent disk related details. Events tab will provide you recent activity’s on newly created desktop pool. Finally Policies tab, if you have any custom policy you can provide here for particular desktop pool. 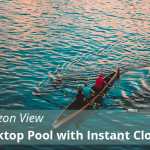 So we successfully Created Dedicated Desktop Pool with Linked-Clone. We will discuss user entitlement and other options in next blog post.